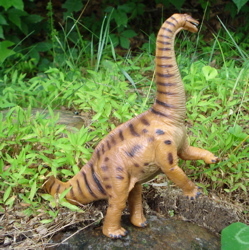 Interested in an Apatosaurus of your very own? If so click here, and you'll link to Amazon where you can find all the A-pats your heart desires. The first Apatosaurus I came upon, wasn't. This was because it was the SRG "Brontosaurus" (thunder lizard). (Left) In essence an Apatosaurish shaped metal cloud with virtually no detail. Largely small round indentations for the eyes and that was about it. Back in 1951 this was the best (and only) one that I could hope for. 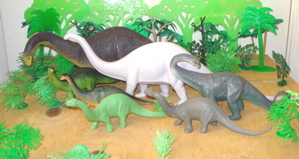 In 1955 The Louis Marx Company came out with their original Brontosaurus and then four years later, in 1959, they came out with their second. These were a quantum leap forward, even if they did have the wrong (Camarasaurus) head, no one knew it at the time. 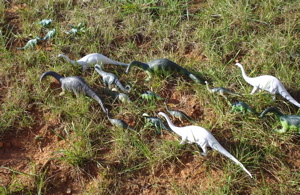 They were made of rubber and at just about nine inches in length (~1/100 scale) and they were great Dinosaur toys. In 1987 Invicta upped the ante with the introduction of their new (huge) 1/40th scale 20" Dinosaur toys. No longer in production these are/were beautiful models. And they could pretty much stomp smaller Dinosaur toys that got in their way. In Dinosaur toys terms this was pretty much what the 75 foot long, twenty-five-ton Apatosaur could do in real life. Brightly painted (this one is twenty years old and play-faded) by Safari Ltd., (Opens new window)	a truly huge and heavyweight addition to the herd. Competitively priced they (along with their Dino-brethren, Tyrannosaurs, Triceratops, Stegosaurs, etc) took the Dinosaur toys market by storm. but all-in-all it was too little, too late and Safari has gone on to dominate the Dinosaur toys market while Invicta is out of the business. ...and especially so when facing Megalosaurs. This concludes the current listing of Apatosaurs. If you know of others please contact me and I'll add them, with their pictures, to the list of dinosaurs. Many companies never made an Apatosaurus (for some reason) but did make a variety of other Sauropods. 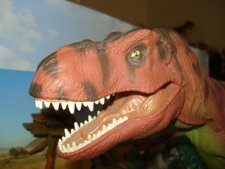 If your interest has been piqued to learn about collecting Dinosaur toys, simply see the fun one can have with their collection or learn more about collecting and Dinosaurs too, please check out The Dinosaur Toys collectors Guide Home Page.